Spring equipment: Prepare spring equipment for storage so it’s ready to go once warm weather arrives next year. Evaluate the condition of belts and spark plugs, change oil, sharpen blades, and remove dirt. Fuel tanks of lawnmowers and tillers should be drained. Clean and sharpen tools before storing them in dry locations. Christmas tree selection: Whether you’ve prepared for an outdoor or indoor Christmas tree, a selection needs to be made. If you need to pick an evergreen out, there are several criteria you should keep in mind. Look for firm needles on available trees; they should bend, not snap, when you pinch them between your fingers. The freshest trees have moist, possibly sappy, stumps. Holiday plant maintenance: ‘Tis the season for holiday plants…and maintenance! Cut two inches off the base of the trunk of your Christmas tree. These evergreens can absorb a gallon of water in the first 24 hours, so place your tree in a bucket of water once it’s been cut. In its first week, a tree needs constant watering so check the stand twice per day. If Christmas cacti are growing buds, they don’t need as much water and fertilizer as they have been getting. Celebrating the holidays with some festive poinsettias? They’ll retain their color if placed in areas of the home where temperatures range between 65°F and 70°F. Keep their soil moist, not soggy. Houseplants: Winter doesn’t mean having to forego new flowers. Paperwhite bulbs can be started every other week in gravel, marbles, or soil. Watering and fertilizing houseplants can be reduced by half now. 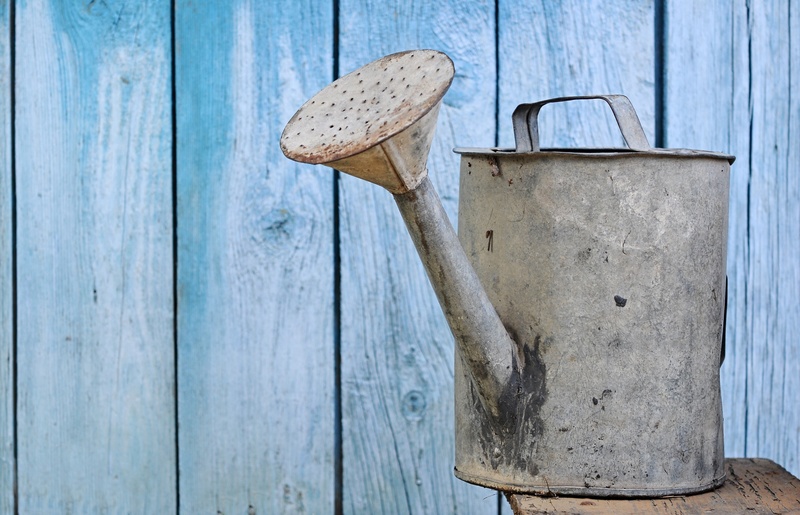 Avoid watering houseplants in the afternoon. Indoor plants’ leaves shouldn’t be wet at night. Winter plant shopping: Temperatures of less than 50°F can damage houseplants, so take precautions when transporting new plants back home. Like frozen groceries purchased in the summer, new houseplants need to be brought indoors as soon as possible in the winter. Sleeves or sacks made of paper or plastic can provide temporary insulation for new plants. Prevent root rot by draining greenery soon after. Spider mites: A warm, dry environment unfortunately encourages the reproduction of spider mites. You know there’s a problem when fine webbing starts to form on the undersides of foliage, at the base of stems, and on young buds, so keep your eyes peeled. If afflicted, large plants can be rinsed off in the shower repeatedly. Smaller plants can be held upside down and gently moved around in soapy water. Evergreen decorations: If you’re using evergreens as holiday decorations, place them carefully. Sap from limbs can ruin the finish of wood surfaces, so use parchment, colorful felt, or fabric as barriers. Gardening gifts: One of the best things about hobbies is the feeling you get when you find opportunities to share the joy it brings with others. Do you have loved ones who enjoy flowers and other plant life as much as you do, or who might with some encouragement? Give the gift of gardening this holiday season with appropriate presents, such as books, gloves, tools, weather instruments, and decorative pots. Garden work: Presents are fun, but they’re also reminders that a gardener’s work is never finished. Open-grown apples and pears should be pruned, unless they’ve been trained against walls. Prevent bleeding by pruning acers, birches and vines before the end of the month. The last root crops, including leeks, parsnips, winter cabbage, and sprouts, should be harvested. Yard maintenance: Tend to your yard in December. Cover perennials beds with material capable of protecting them from the elements for the rest of the winter. If you want your lawn to look pristine in the spring, however, limit the amount of steps you take across frozen grass until the yard is covered in a blanket of snow, which protects the plant life underneath. Roadside snow containing salt should be kept out of the yard. Remove snow from tree and shrub branches carefully to avoid breaking limbs; allow ice to melt naturally. Birds: Birds enhance the view from your window. You can do more to keep them around than just continually stocking your bird feeders throughout the winter, as effective as that is. After the holidays, plant your Christmas tree outside. Redecorate it with edible ornaments for the birds. Wrap the tree in strings of cranberries and popcorn. Push apples, oranges, leftover breads and pine cones covered with peanut butter and birdseed deep into tree branches. Birds need to wash their food down with water after they’ve eaten; birdbath heaters prevent water from freezing without harming animals. Recycle Christmas trees: Strategize how you might recycle Christmas trees using methods that will benefit your garden most. Insulate perennials with removed branches. If you could use extra mulch this planting season, get your hands on helpful equipment you can eventually use to chip and shred these branches in the spring. Chop the trunk up, then season it so the wood can feed next year’s fires.